TORONTO, ON--(Marketwired - July 05, 2016) - Aon Hewitt, the global talent, retirement and health solutions business of Aon plc (NYSE: AON), today released results of its pension plan solvency survey for the second quarter of 2016, which found that the health of Canadian defined benefit (DB) pensions improved quarter-over-quarter despite the recent headwinds from Brexit. Through June 30, overall pension solvency of those plans surveyed rose by 2.3 percentage points in the quarter, as the immediate selloff in equities following Britain's vote to leave the European Union reversed in the last week of June. Going forward in the post-Brexit world, however, lower bond yields and the prospect of heightened market volatility continue to cloud the outlook for pension solvency. The Aon survey, which measures plans' assets over liabilities to calculate their solvency funded ratio, is based on results from a total of 449 Aon Hewitt-administered DB pensions from the public, semi-public and private sectors. 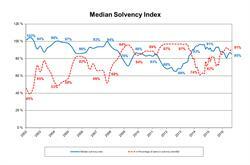 Median solvency on June 30, 2016, was 85.4%, compared with 83.1% at the end of the previous quarter and 87.1% as of June 1. Aon's data suggest that the short-term impact of the UK referendum -- including the biggest two-day stock rout in history -- may already be subsiding. In the 48 hours after the vote result, overall pension solvency declined from pre-Brexit levels by as much as 1.7 percentage points, but recovered substantially as stock markets rallied last week. By quarter-end, 9.1% of surveyed plans were fully funded, an increase of more than a percentage point from the fully funded ratio in the first quarter (8%). "Brexit understandably created a lot of anxiety around the state of the global economy and the destabilizing effect of nationalist movements, but the reality is that the event itself had minimal short-term impact on our pension clients, who think long-term," said Ian Struthers, Partner, and Investment Consulting Practice Director at Aon Hewitt. "However, we believe the continued decline in bond yields, which is likely only to be aggravated in a post-Brexit world, highlights a longer-term challenge for pensions, and represents a risk factor that plan sponsors need to have a position on and address." Beyond the equity selloff, Brexit sparked a rally in government bonds as investors fled to safety. Bond yields (which are inverse to prices) plummeted. Lower yields adversely affect pension solvency, as they effectively lower the discount rate that plan sponsors apply to liabilities. 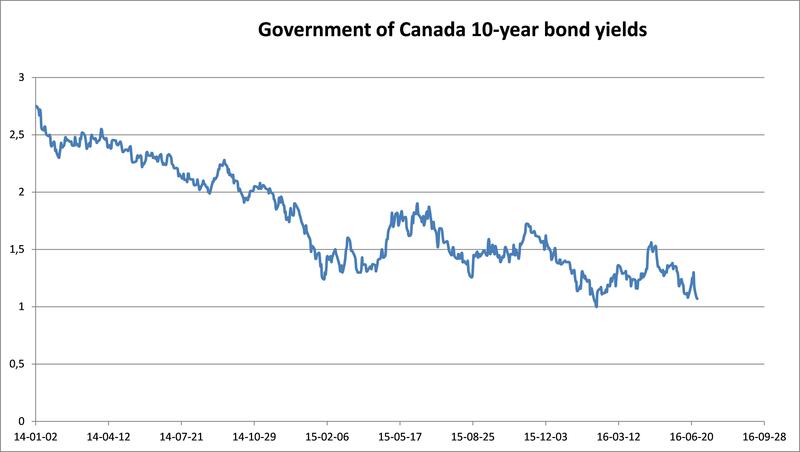 Between June 23 and June 29, the yield on Government of Canada benchmark 10-year bonds declined by 18 basis points. 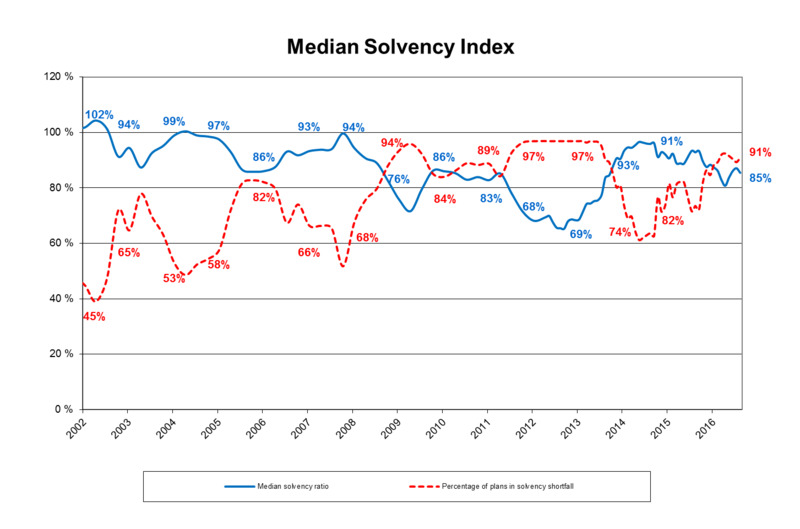 Plan solvency over the quarter still improved, but largely because of an actuarial change that dampened the impact of lower yields: the Canadian Institute of Actuaries introduced new guidance in May increasing the credit spreads over benchmark bonds that plan sponsors can apply when calculating solvency. A critical issue, though, is that unlike the reversal of the equity selloff, the rally in bonds has not reversed significantly since the referendum. In fact, Brexit seems only to have aggravated a long-term decline in bond yields. From January 1, 2014 to the end of Q2 2016, the yield on Canada benchmark 10-year bonds fell by more than 160 basis points (see chart below). On a global basis, yield suppression is even more severe: as of May, more than a quarter of the securities on the JP Morgan Global Government Bond Index had negative yields. Events like Brexit, which create uncertainty in capital markets, are likely to suppress yields even more. A continuing, deep low-yield environment, coupled with ongoing uncertainty in risk-seeking assets and currencies, suggests that plan sponsors will be challenged to meet their target plan returns and need to evaluate risk in their portfolios and steps to mitigate volatility, says Struthers. "Despite the recent rebound in stocks, it's difficult to see on the horizon anything other than heightened volatility in stocks and suppressed fixed-income yields," he adds. "In this environment, active and informed risk and volatility management, including diversification, smart hedging and other de-risking strategies, should be on the minds of all pension plan sponsors." Beyond Brexit, plans have other issues to address closer to home -- among them, the recently agreed expansion of the Canada Pension Plan (CPP), which will begin to roll out in 2019. CPP enhancement comes at a time when many defined benefit pension plans are -- or should be -- reviewing their funding formulas. With the added volatility in markets, William Da Silva, Senior Partner and National Retirement Practice Leader at Aon Hewitt, says that task has now become more challenging, and yet more vital than ever. "Market volatility, especially when linked to high-profile events like Brexit, naturally leads plan sponsors to carefully consider their investment strategies," added Da Silva. "That's perfectly appropriate, especially in light of hedging liability movements, but they should also not lose sight of the other levers at their disposal to manage risk. With changes in the CPP coming, the long-term market outlook clouded, and 2016 being an important year for most plan sponsors in establishing minimum funding for the near future, plan sponsors should go beyond investments and consider ways to optimize their funding and benefit strategies in response to a rapidly changing pension landscape." Aon's Median Solvency Ratio measures the financial health of a DB plan by comparing total assets to total pension liabilities in the event of plan termination. It is the most accurate and timely representation of the financial condition of Canadian DB plans because it draws on a large database and reflects each plan's specific features, investment policy, contributions and solvency relief steps taken by the plan sponsor. The analysis of the plans in the database takes into account the index performance of various asset classes, as well as the applicable interest rates to value liabilities on a solvency basis. Aon plc (NYSE: AON) is a leading global provider of risk management, insurance brokerage and reinsurance brokerage, and human resources solutions and outsourcing services. Through its more than 72,000 colleagues worldwide, Aon unites to empower results for clients in over 120 countries via innovative risk and people solutions. For further information on our capabilities and to learn how we empower results for clients, please visit: http://aon.mediaroom.com.